On Oct. 28, the Metro Board of Directors are scheduled to vote on an alignment for the Regional Connector and whether to launch a final environmental study — the prelude to construction of the project. In the project’s draft environmental impact statement/report, Metro staff recommended a fully underground line between Little Tokyo and 7th/Metro Center with four stations: Little Tokyo, 2nd/Broadway, 2nd/Hope and 5th/Flower. The challenge is that the fully underground line is a pricey proposition at $1.245 billion in 2009 dollars, leaving a funding gap of about $173 million because the line wasn’t originally envisioned as going fully underground. As a result, Metro staff have said — not recommended, mind you — that one way to cut costs would be to eliminate the 5th/Flower station. Attentive readers already know the connector is a just under two-mile light rail line in downtown L.A. that would connect the Gold Line, Blue Line and future Expo Line — allowing passengers to travel through downtown without having to transfer. The project should provide for faster and more seamless travel for light rail passengers across the region. The 5th/Flower station is in the heart of downtown, so I thought it would be interesting to do a poll — albeit an unscientific, unofficial one — to see what Source readers thought about the issue. •As mentioned above, the Regional Connector wasn’t originally planned as being fully underground. Other alternatives were being studied, including some that had the train crossing Alameda Street at street level and possibly having Alameda cross under the tracks. •Those plans were not well received in Little Tokyo because of concerns the train would impact traffic and pedestrian flow in the community. As a result, the fully underground alternative was developed and studied as part of the DEIS/R. •Why is the 5th/Flower station being discussed for elimination? Because it’s just three blocks from the existing 7th/Metro Center where all light rail trains will continue to stop. Yet the 5th/Flower stop is also in the heart of downtown and near existing high-rises, as well as the Central Library. •What’s the area around the station look like? Click below to see a satellite view. The Fully Underground LRT Alternative would be the most expensive to construct ($1,245.2 billion in 2009 dollars), but it would create the most new jobs and attract the most riders, thus making it the most cost effective build alternative per FTA’s New Starts CEI. It would also be the second least expensive project alternative to be operated, after the Underground Emphasis LRT Alternative. A qualitative metric of financial feasibility was also used to compare the proposed alternatives. Per Metro’s current financial outlook, additional revenues will need to be identified to fully fund the capital costs of the build alternatives. 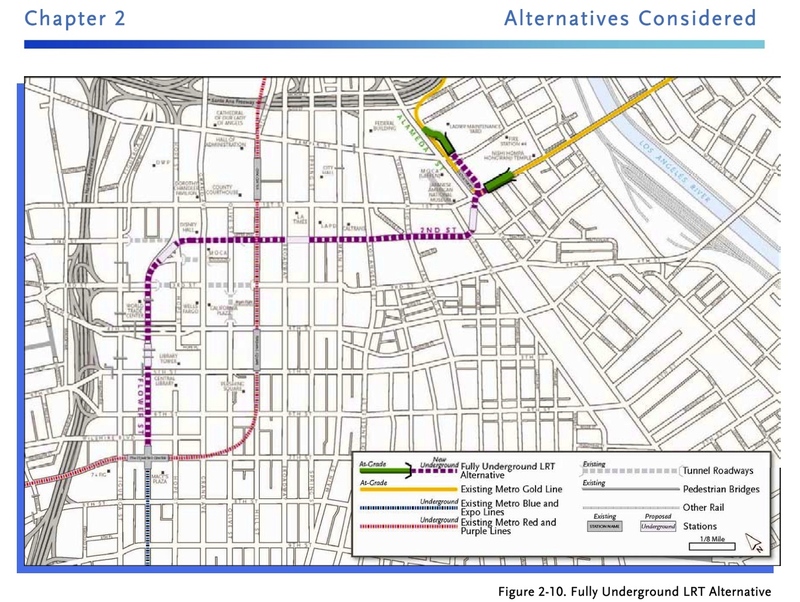 Possible ways to reduce costs are being explored, and the possibility of eliminating one station (5th and Flower) from the Fully Underground LRT Alternative is being explored as a way to reduce capital costs. Despite the need for additional revenues, none of the alternatives would present a great enough revenue gap to render themselves financially infeasible. •The Connector is being funded with a variety of sources, including $160 million from the Measure R sales tax increase approved by voters in 2008. Metro is also negotiating with the Federal Transit Administration to have the FTA pay for half the cost of the project through its New Starts program. •Those who want to officially comment on the DEIS/R and/or the station issue can use the online comment form.